Cassava is a tough plant. It can withstand drought and grow in marginal soils while still yielding its crop of starchy roots. Its roots can stay in the ground, waiting for harvest until other food sources run low. But breeders and scientists in Africa are working to make cassava even tougher, developing varieties that are resistant to pests and disease. 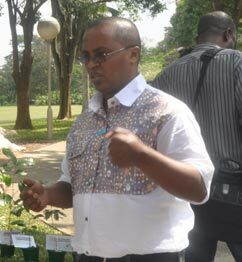 One of those researchers is Ismail Yusuf Rabbi, a cassava geneticist at IITA in Ibadan, Nigeria. He visited the Boyce Thompson Institute (BTI) and Cornell University last week to discuss his ongoing collaboration with NextGen Cassava, a Cornell-led project funded by the Bill & Melinda Gates Foundation and the Department for International Development (UKaid). The project aims to use Big Data to accelerate cassava breeding. Cassava is vital to food security and serves as a major staple crop in Africa, Latin America, and some parts of South Asia. But its production is threatened by cassava mosaic virus and cassava brown streak disease as well as several pests. Rabbi and colleagues are working to develop varieties of cassava that are resistant to these diseases. They also aim to increase the starch content of the tubers and to develop high-yielding varieties which will reduce pressure on the limited land and water resources. “I can say that there has not been a more exciting time to be a researcher on the continent and to work on a crop that feeds more than 500 million people,” said Rabbi. Cassava breeding is a slow process, but Rabbi and colleagues from IITA, the National Root Crops Research Institute (NRCRI) in Nigeria, and the National Crops Resources Research Institute in Uganda hope to speed things up using the genetic resources in NextGen’s cassavabase.org, which can help breeders to pick the best parental varieties and provides a unified platform for sharing cassava breeding information. “It’s a great tool to have because, first of all, it’s open access meaning that the data that we produce can be used not only by ourselves, but by the cassava breeding community worldwide.” They can also record their field observations directly using handheld tablets or phones. Rabbi is working with BTI’s Associate Professor Lukas Mueller to develop efficient ways to collect and store data and with Geneticist Jean-Luc Jannink of the USDA Agricultural Research Service to use that data to better predict the performance of new varieties. IITA also partners with national breeding programs in Nigeria, Tanzania, and Uganda to improve cassava crops. I will like to be a beneficiary when the research for new cassava that are resistant to pests and disease are done. Kudos to IITA and Yusuf Rabbi.